The Lipan Apaches at one time lived in the area of Southwest Texas and its border with northern Mexico until the 1880's, after Texas had become a state and passed laws forbidding Native Americans from living in the newfound state. At that time, most of the Lipan Apaches moved to the mountains of Mexico and to several of the reservations in New Mexico and Oklahoma. Yet many of them continued to live in the area by changing their names and adopting the Mexican culture. Robert Soto is a descendent of Chief Poca Ropa of the Little Breech Cloth Band of the Lipan Apache Tribe (also known as the Lipan Apache Tribe of Texas). The Lipan Apache Tribe that was nearly annihilated in the nineteenth century. Today the tribe numbers at approximately 4,500 members. 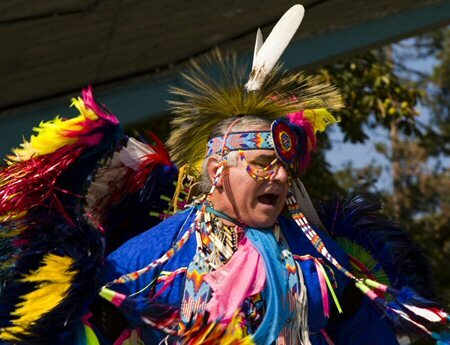 Robert Soto has been Indian dancing for about 57 years, since he was 8 years old. 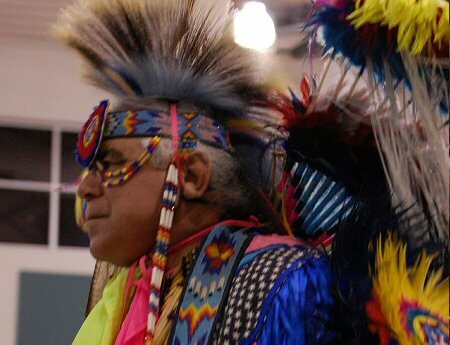 He has been a Feather Dancer for over 48 years and has won many awards for his Indian dancing and artwork in various pow wows throughout the nation. He has been Gourd Dancing for many years and currently is an active member of the Gulf Coast Tia Piah Gourd Dance Society of Houston, Texas. 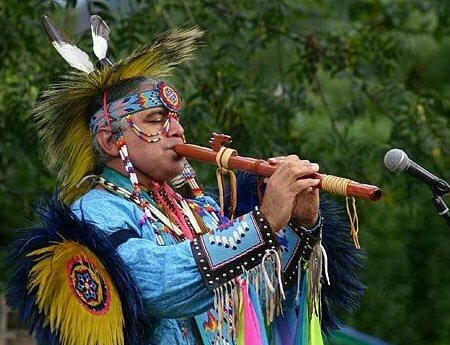 He also plays the Indian Love Flute and has been performing the Eagle Dance and the Hoop Dance for over 40 years. Robert's dancing is his way of preserving the American Indian culture. When Robert dances, he dances in honor of his ancestors who danced before him, and for the glory and honor of the Lord Jesus Christ, who has given him the opportunity to dance. Robert enjoys his culture and will take every opportunity to share it with others. All of Robert's Indian outfit was handmade by him - from the beadwork to the featherwork. His outfit goes with him wherever he travels. He, along with the South Texas American Indian Dancers, performs about 40 times a year. During his dancing career, Robert has had the privilege to perform and share his heritage and faith internationally. In the summer of 2000 he, along with his daughter and six other Native Americans from the United States and Canada, traveled through Europe. His travels took him to France, Germany and Switzerland, performing 29 times in the 19 days in Europe. They were invited back for a repeat performance in the fall of 2001, and he has since led several ministry tours in Europe and Australia. He also had the privilege to perform in the jungles of South America among the Xavante Indians and for the grand chiefs of eleven other tribal groups from Argentina and Brazil. Along with dancing abroad, he has performed throughout the United States and in Mexico and Canada. In the past fourteen years, he has traveled and danced in France, Germany, Switzerland, Austria, Czech Republic, Netherlands, Wales, England, Australia, Peru, Brazil, Mexico, Canada and in 39 states in the United States. Robert Soto has also played a role in changing American Indian Rights on the federal level. On March 11, 2006 the federal government brought an agent from the Department of Interior into the pow wow circle of Robert's family's pow wow. In the process they took 42 of his eagle feathers. This introduced him to a new opportunity to educate the Native and non-Native community about laws that are not just, and as a result he has become a spokesman for injustices done to our Native people. What man meant for evil, God is now taking and using to change laws that discriminate against our American Indian people. Some people call it being an activist for Native Rights. He just calls it a mandate from God the Creator to change laws that bring more harm than good to our Indian people. Robert won a lawsuit against the Department of Interior in 2015. As part of the settlement, the DOI gave Robert back his eagle feathers. Also, he and over 200 Lipan Apache Tribe members can own and use eagle feathers and feathers other migratory birds for ceremonial purposes. Robert Soto presently is the Chairman of the South Texas American Indian Dancers, a group which consists of about 45 dancers and 25 non-dancers from 16 different tribal groups. He also is the pastor of McAllen Grace Brethren Church and the Native American New Life Center in McAllen, Texas. The Native American New Life Center, a ministry of McAllen Grace Brethren Church, is committed to reaching out to both the spiritual needs and physical needs of our Native people in the community. The service is a Christ-centered ministry that strives to meet both our spiritual and cultural needs - from the order and style of worship to the songs we sing. This service has now branched out to locations in San Antonio and Brownsville which meet monthly. Robert is also the founder of Son Tree Native Path Ministries. It is a ministry dedicated to serving our Native communities in Texas and throughout the United States and Canada as they take teams of dancers throughout the world with the desire to share the complete person we have become as Christians. Robert is also invited several times a year to conduct Native church services at various pow wows and is frequently invited to speak on the contextual movement and how to better reach our Native People for Christ. Robert holds a B.A. in Biblical Education from Florida Bible College, and the degrees of Master of Divinity and Master of Arts in Christian School Administration from Grace Theological Seminary in Winona Lake, Indiana. In past years, Robert has had the privilege of working with the Seminoles of Florida and the Pueblos and Navajos of New Mexico. He had the privilege of working as a dancer, alligator wrestler and snake handler for the Seminole Indian Reservation for three years, while in college. He also was a tutor at the Miami Urban Indian Center for two years. Robert and his wife, Iris, have two grown children and three grandsons. Robert is an active member of, and serves as Vice Chairman on the council of the Lipan Apache Tribe (also known as the Lipan Apache Tribe of Texas). 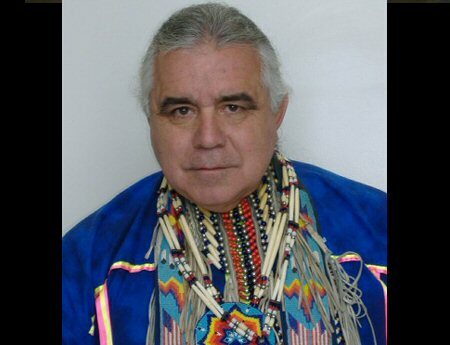 He is also the Director of Communications of the tribe and is the founder of the tribal Buffalo restoration project. Along with the following, he is heading the march in developing a faith based cultural center that will meet the physical needs of McAllen Grace Brethren Church, the Native American New Life Center, Son Tree Native Path, the Lipan Apache Tribe of Texas and our tribal historical museum. When time permits, he and a couple of others are working on the restoration of our Lipan Apache language and developing a working dictionary to help others in our efforts to bring our Lipan language back. Robert, along with the Huisache Creek Singers, has recorded four cd's of pow wow-style songs that are sung around the drum during the worship service of the Native American New Life Center. The Huisache Creek Singers are also invited numerous times a year as host or invited drum at various pow wows. Robert has also released three cd's of his flute music. "The Indian Love Flute has been a source of comfort and inspiration. The songs I play come from the heart and soul of my personal experiences in life, and my relationship with my Lord and Savior and Great Creator, Jesus Christ. Anything in my life can spark up a song or melody. Some of the songs reflect times when all I had was my flute and my God. Others remind me of the awesomeness of His creation in the world around us. Wherever I go, at least one of my flutes travels with me. I even carry a small flute in my briefcase so that I can have one whenever a song comes to my heart. Every flute is unique. I collect flutes because each flute has a unique tone which will produce a unique song and sound. I do make my own flutes, but am always eager and ready to purchase one. Some of my favorite songs came when I simply picked up a flute from an Indian trading post and played a song for the first time, and if I do not buy that flute, that song will be lost forever." Robert Soto is proud of his American Indian heritage and is thankful for the culture God has given him. He is always eager and willing to share it with others and to tell about what the Lord Jesus Christ, his Savior, is doing in his life and the journey in history that has brought him this far in his walk with our Lord and Savior Jesus Christ.